You can learn to ski! 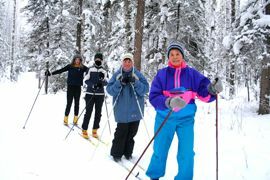 During the snow season, the Ptarmigan Nordic Ski Club runs a learn-to-ski program for adult skiers of all experience levels. 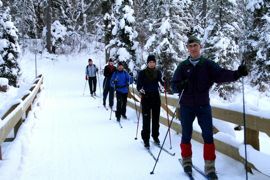 Our CANSI qualified instructors teach beginner, novice and intermediate skiers both the classic and skate ski techniques. If you don't know the difference, come out to a lesson and we'll show you! Our instructors can also give you some tips on waxing skis or even buying gear. Lessons are held at the Doug Barnes Cabin on Saturday afternoons at 2pm sharp. Each lesson begins with a warm up session in the field adjacent to the cabin. Instructors will then split up groups based on experience and skiing technique. Lessons are free of charge. 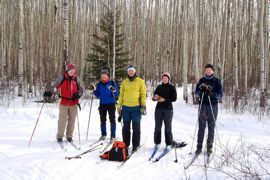 For insurance purposes, students must become members of the Ptarmigan Nordic Ski Club. Where do I get skis? 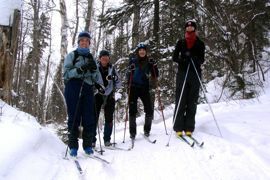 The ski club has a limited number of skis, poles and boots available for adult students who want to try the sport, and is for use during lessons only. This equipment is not for rent. To use these skis, arrive to adult lessons early, as it is loaned out on a first come - first serve basis.The cabin opens up at 1 pm and a club volunteer will hand out the gear based on your height/boot size. Members must return their gear no later than 3:30 pm. 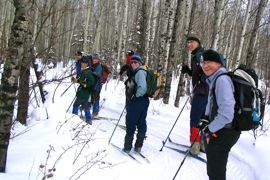 Skiers who decide to take up the sport are encouraged to buy their own equipment once they are comfortable with the sport. You can check out our 'ski buying guide' if you're looking at buying your own skis. Or, an instructor would be happy to give you some tips and suggestions.